The Arab League was formed in 1945, and its stated goal is to promote development and co-operation between its member states. It currently has 22 members from round the Arab world, and engages in many areas, such as education. It also works on scientific, social, political, and economic programmes designed to develop the community as a whole. The Arab League promotes the idea of an Arabic homeland, whilst maintaining the sovereignty of its member nations. The League has played a vital role in solving internal conflicts, and assisting with diplomatic crises that have risen. The flag of the Arab league is green, featuring the seal of the Arab League. 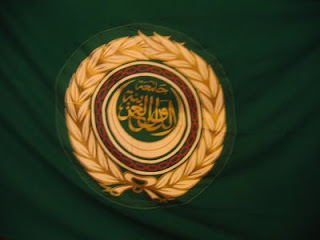 Within the seal is the organisations name in Arabic, over a white crescent, and surrounded by a chain of 22 links, with each link represents each member state. The whole emblem is enclosed within two olive branches.